I'm posting more on the inverter charger, simply because I can't get over just how significant this is to Lady Jane and all who sail on her. First off, it's a Studer XTM-3500-24. 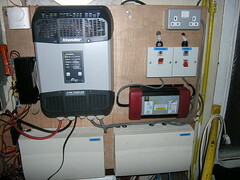 An pure sine inverter/charger which I bought from Barden at the boat show. Following some negotiation, I got what I consider was a excellent price for both the inverter charger and it's accompanying remote control/display unit (RCC02). By the way, I'd say the remote control is pretty much essential. Previously, I'd been planning on buying just a 3kva pure sine inverter. As it works out, it costs about the same for an inverter charger as it does for an inverter, with the advantage that the inverter charger does more. Again, it was mainly on price that I opted for the Studer inverter charger. This worked out at close on half the price of the inverter I had been considering. Plus the XTM-3500-24 is capable of far more. The main thing is that the inverter provides 3.5 kva, which is more than the 2.0 kva generator I normally use for most power tools and certainly more power than the 1.0 kva pure sine inverter I bought because of the central heating. More powerful than both of them put together in fact. For any of the above, I previously had to start up the generator specially. The central heating system relies on power to cool it after it's been running. This would just shut down, and sometimes play up on a manual restart. I had to resort to waiting for the hot water/central heating system to stop completely before I could switch to/from generator power. The radio I use on deck would shut itself off during switch over. In doing so, annoyingly, it would reset back to it's default settings, so needed fiddling with to get back to the station I was on (I tried using rechargeable batteries, but that was not a big success). If the fridge motor happened to be running during switch-over it would, for some reason, consume a huge amount of power running at full speed when the power went on again. This new inverter charger acts like an interruptible power supply (UPS), so there is no power failure on switch over. Even the radio carries on as if nothing happened. 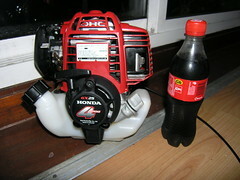 Now I can start and stop the generator pretty much at will with no problems at all. With the new inverter/charger, my thinking on generator power is changing. It now more fulfils the role of a battery charger than it does that of a mains power provider. This is mostly because I'm no longer concerned about that switch over from battery to generator power. That automatic generator startup on a defined voltage level really comes into it's own now. I am developing more on this, so will post about it when I'm further down the line. Sometimes, new visitors to Lady Jane don't grasp the significance of appliances and their power consumption, and just leave things running. I'd have the generator running then sometime after shutting it down would discover the inverter had tripped and that the fridge has been off. Obviously this should no longer happen. This inverter seems to be vastly more efficient than the last inverter, as evidenced by the higher than usual voltage showing the following morning. I suspect that it's ability to hibernate when there is no power demand is a big part of that. The remote control shows all kinds of cool stats, this helps me keep a close eye on things like the battery voltage and mains amps being consumed. I now have two easy to program relays on the unit. One of these will be used for powering a socket, initially only when a generator is running. I could also use this to power my Christmas lights each day between 5.00pm and 11.00pm come December. The other, I have yet to decide what to do with. The inverter/charger also saves me that valuable space the battery charger took up. What a difference this makes to life. I've had this installed for one day, and already I'm enjoying the benefit of my new 3.5 kva inverter/charger. To step back a bit, Andy and I sat down and discussed a plan for Lady Jane's power sometime in late 2007. An almost all day discussion if I remember rightly. 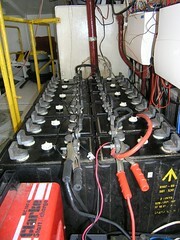 The batteries would provide 24V for the lights and other boat related functions. A big 3kw, pure sine, inverter would provide the mains power from the batteries. 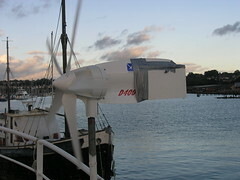 The batteries would be topped up using the wind generator. When the battery voltage dropped below a certain point, a generator would automatically start to charge the battery. 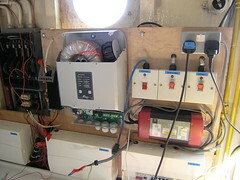 The system would automatically switch power between a deck input (either one of my 2 deck generators or shore power), the donkey engine and the inverter. A separate mains power socket would be active when a generator/shore power was available to run things like a battery charger. 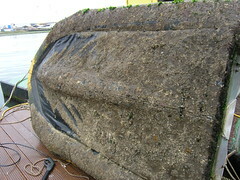 240V mains sockets would be installed at key points on the boat. All that time ago, delivery on the plan seemed like an impossible task as some of this stuff neither of us had any idea about. Of course, some elements of the plan such as the 24V lights and the wind generator were already in place and just had to be incorporated into whatever we were doing. 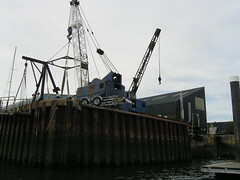 The first of the actual wiring was done mid May 2007. At that point I had a 1 kva pure sine inverter. This initial system also handled the switching from the various power sources. I have crafted up an automatic generator starter, based on the battery voltage. 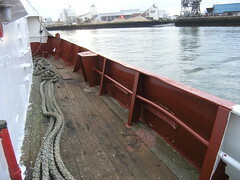 We have mains sockets in the galley, on deck, in the workshop, in the wheelhouse, in the fish hold and in the battery room. 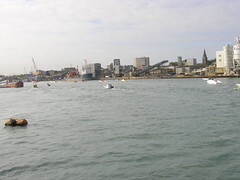 Now, as a result of a visit to the 2009 Southampton boatshow, I have the last of the major pieces of the original plan installed. The slightly bigger than planned pure sine inverter which is also a battery charger. Suddenly, with the addition of this new inverter/charger, everything has come together beautifully. Here you see the steering gear all boxed off, and that valuable storage space now available to me again. 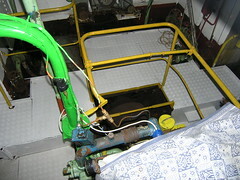 The major leak in the steering hydraulics was tracked down to one of the solenoids. I kind of knew that anyway, but had not really had the time to address it properly. Now the troublesome solenoid is temporarily off until I can get that sorted. In the meantime, I made up a blanking plate which, along with a gasket, has stopped the oil leaking for now. 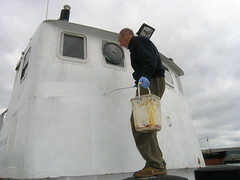 I'm pleased to say that all the oil that had pooled on the deck below the steering gear has also been cleaned up. Yuck. If you look carefully, you can also see the emergency steering arm in the background there. This, along with it's locating pin, has now been rounded up and safely stowed. I know the very place to take my leaky solenoid, it's just getting the time to go there as it's the other side of Portsmouth. 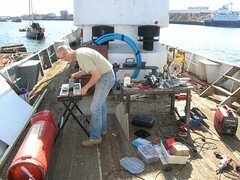 In the meantime, the steering does still work using the manual pump in the wheelhouse. As things progress, and conditions on board Lady Jane improve, I find it harder and harder to leave the old girl and return home. Warm, calm, evenings only serve to increase the difficulty of leaving. A few weeks ago, as part of the procrastinating over returning home, I stopped in the middle of the river to take some pictures. 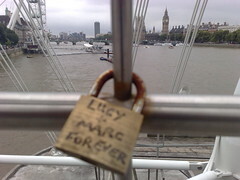 Here you see one of the best I took. The quality of these 'evenings on the river' pictures always varies so wildly due to a mixture of the light and the constant movement on the water. 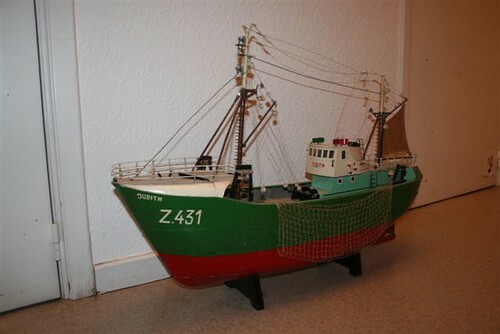 As it happens, this also answers ValleyP's questions about what size and type vessel Lady Jane is. Late on Friday night this beauty cruised by me on the River Itchen. Sorry about the rather dark picture. To give you an idea of it's size, it's bridge is as high as Lady Jane's wheelhouse. 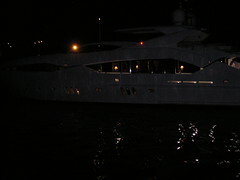 Something I don't think I've seen on any other yacht around here. I believe its one of the new Predator 130's from Sunseeker, being launched at the Southampton boat show which started on Friday. Now there's some serious money. On board I have a whole series of tasks that need doing periodically. I should, I suppose, make a list of these routine tasks so I can stay on top of them. Removing the rubbish (garbage) is just one of those routine tasks that left too long can take on epic proportions. 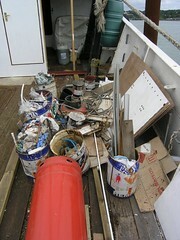 I hasten to point out that this is boat project garbage only. 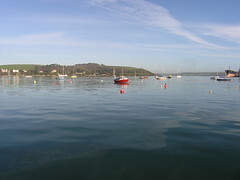 The normal household waste is taken off the boat at the end of the weekend, with recycling taken off as and when the respective recycling bins are full. The poor Old Sow was loaded to the gills with the rubbish accumulated over the last six months or so, carefully avoiding sharp edges against the tubes. This in turn got loaded into the truck and sneaked into the council tip (dump). The reason I say sneaked is that the rubbish from Lady Jane tends to be rust, paint chips, old rollers and generally awful stuff. I compare this to the lampshades, beautiful wood, old chairs and other quite good, sometimes useful, looking things 'normal' people throw away. It almost feels criminal tipping in a tin full of rust and debris from Lady Jane in amongst all that other stuff, so I have this weird fear getting thrown out for having unacceptably bad rubbish. In response to an anonymous comment yesterday, I thought I'd explain how Lady Jane's steering mechanism works. 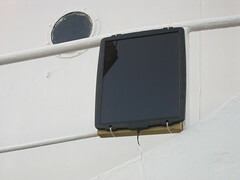 First off, the 'lump' in the middle with the wires from it, and connected to the arm, which is in turn connected to the rudder post, is the rudder position indicator sender. 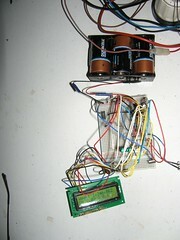 At a guess, this sender is a variable resistor which probably operates between 0 and 24V. 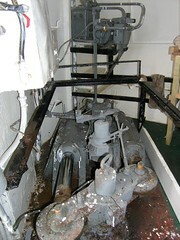 This in turn is shown as the rudder position in the wheelhouse, with the midships position likely at 12V on what is probably essentially a moving coil volt meter. Hard port would be say 24V, while hard starboard would likely be 0V. 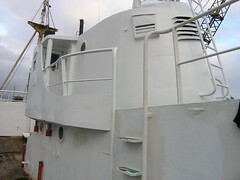 I do not doubt it is very handy for a skipper to be able to see instantly where the rudder is positioned, regardless of the steering mechanism involved. 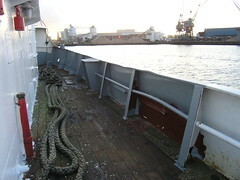 Now Lady Jane has three separate mechanisms for steering, which are all achieved by moving the rudder via the rudder post you can see right in the foreground of yesterdays picture. 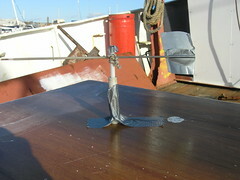 The crudest, and simplest, mechanism is steering using a lever which will go over the post there. I have the lever, and key, floating about on board somewhere. (Makes mental note to get this together and stowed safely). I've not tried to use the lever, but suspect it would take two people with ropes and pulleys to actually move the rudder with any semblance of control over Lady Jane. 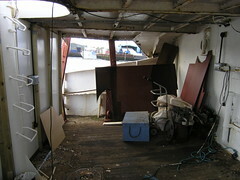 Oh yes, and a lot of shouting and cussing from the wheelhouse! 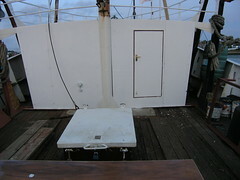 The second, and currently most used, method of steering Lady Jane is by using the manual hydraulic pump directly connected to the wheel in the wheelhouse. 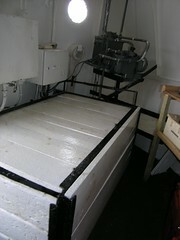 The pump in the wheelhouse holds a reservoir of hydraulic oil which is pumped through port or starboard steering pipes down through to the rams which in turn push the rudder. 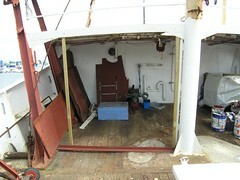 You can just see the pipes entering the steering room from the deck to the left there. The way hydraulics work is a force on a small diameter piston over a long distance (the wheel) causes a proportionally larger force on a larger diameter piston over a short distance (the rudder). Turning Lady Jane using the manual pump takes plenty of turns of the wheel from full port to full starboard. I forget how many, but it's loads. 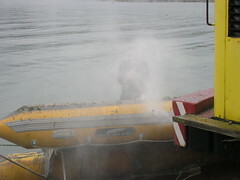 The final method of steering Lady Jane is electrically, using the hydraulic power. The hydraulic power is provided by a 110V DC motor, which drives the hydraulic pump. 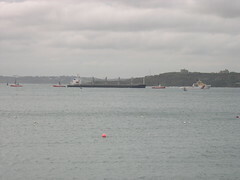 This unit, and it's reservoir, is visible right at the back of the steering room there. The two hydraulic systems are totally independent of each other, so using the autopilot does not move the wheel. I presume there are some one way valves in the piping somewhere which makes this possible, though I don't know where. 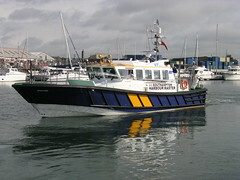 Currently, to operate the steering, there are two buttons in the wheelhouse, red and green unsurprisingly, which turn Lady Jane to port or starboard. These buttons operate the 110V DC hydraulic solenoids, one of which is visible to the right of all the hydraulic pumping gear you can see at the back there. I've taken the left hand solenoid off, as part of fixing one of the leaks I have in the system. The solenoids can also be driven by Lady Jane's autopilot, but this system, although still connected, is defunct as it's compass etc. 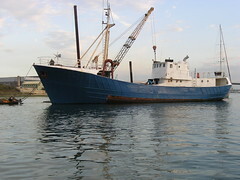 was robbed off of the boat at some point in the past. 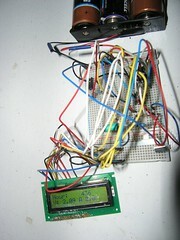 I had been toying with the idea of developing my own auto-pilot, using the NMEA signals produced by the on-board GPS. 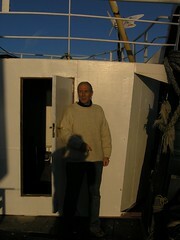 John, the skipper, reports that using the buttons to steer Lady Jane is 'too slow'. This could be an indication that the hydraulics pack needs work. By the screeching noise the 110V DC motor makes, I'd say that's very likely. Anyway, there you have it. Obviously there is more than one project relating to the steering awaiting my attention. To say I've a lot of projects on the go at the moment is maybe somewhat of an understatement. The variety of things I've got to do is great, both in terms of interest and challenge, but not so good in terms of structure and planning or completion. The steering gear hydraulics is a case in point. 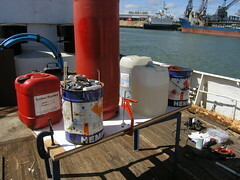 In amongst everything else to be done, I'll also need to set aside time to address the various oil leaks in the system. Each of the four separate leaks is trivial, but collectively they represent a sizeable chunk of work that has to be done. 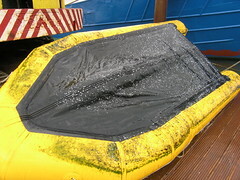 The longer this is left, the more mess there is to clean up afterwards. What I'm starting to realise is I must set up some kind of plan - and stick to it. I know me. If I don't make a plan, I'll continue to drift onto new, and therefore interesting, things while leaving a trail of projects with the challenges resolved, but left unfinished. I remember how constructive the plan I had when leaving Fareham was. Then most things actually got finished. Here's a peek inside the new workshop space. Obviously the sides still need to be completed, but I just wanted to show off the space itself. What is quite strange is that the main deck space does not feel any smaller and, even more strange, this space under the whaleback now seems to have grown larger. 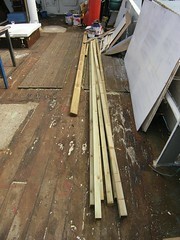 In fact the usable workshop space is 2.7m (9 ft) by 4.3m (14 ft), so a good size then. 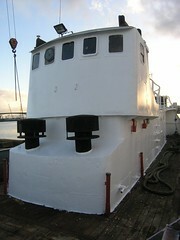 There is still plenty left to do, including rust busting and painting the roof space there. At least that can be done in almost any weather now. 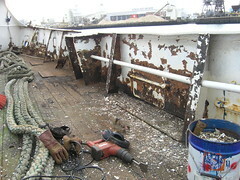 I'm also pretty sure that come winter, condensation dripping from above will dictate putting in some form of insulation into the deckhead. Andy was back on Lady Jane over the long weekend, to help finish the electrics in the new workshop space. One of the first jobs was to put in the necessary wiring from the consumer unit through to the workshop. Now after years of frustration in trying to unroll wire from rolls using all kinds of methods, including rolling the things up and down the deck, culminating in slashing open Fred's hand with a sharp edged roll at one point, I decided enough is enough. Time to make a proper wire dispenser. 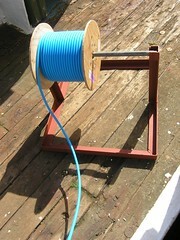 The picture shows my new portable wire rack, made out of a bit of angle iron and some conduit. Simple, but effective. I measure the reel holder's success by the fact that pulling wire through Lady Jane's engine room and holds was completely trouble free, although it took the efforts of Fred, Andy and myself to achieve it. With this done, and more work from Andy, the mains electricity to the forward hold and workshop is now all working 100%. 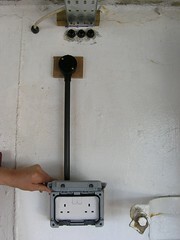 By way of a bonus, we also have a working mains socket installed in the fish hold as well. The luxury of all these sockets now available is going to take some getting used to. A big thanks to Andy for making it all happen. Finally, the door is complete. In the end, the actual fitting was not as much of a problem as I'd envisaged. Andy proved an enormous help though. In the event I know I would have really struggled to actually hang the door by myself. 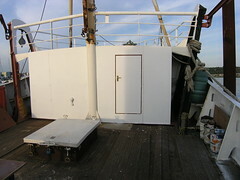 The biggest single issue we had was the ply the door fits into was twisted in the frame I'd built. After re-designing the supporting struts slightly, all was well. 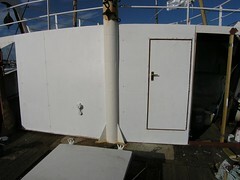 A lick of paint on the front there, and all evidence of any screw heads and clamp marks will be disappeared completely. Oh yes, and the door closes with a satisfying click. A really good result I'd say. 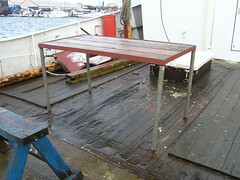 I don't think I've ever done anything on board that has caused as much consternation as this table has. 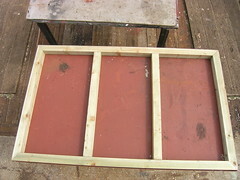 Last I posted about it, Fred had been working on the construction of the frame. 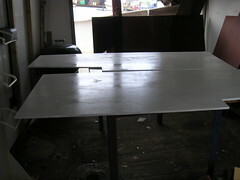 We have subsequently also cut, sanded and glued the table top - out of plywood as planned. 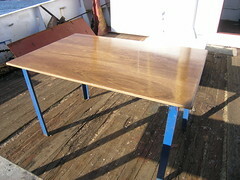 Last week, after Fred had gone, I sealed the table with PVA, then gave it a few coats of varnish. I used varnish purely by way of experimentation on how the varnish I'm using would survive out in the weather. 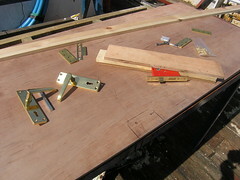 Now I've created myself a problem, as Patch, Andy and Fred are all horrified at the idea of me using it as a work bench. With Patch going so far as to refuse to put mugs of hot tea on it, for fear of marking it. 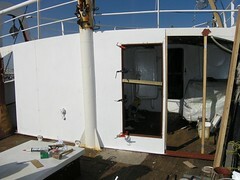 Too late now - working on my new door, when nobody was looking, has already christened it with a few scratches. I'll admit it does look rather good at the moment, but it is, after all, only a bit of plywood. The picture shows the progress so far on the new workshop space I'm creating. As you can see, I've just finished putting in the doorframe. 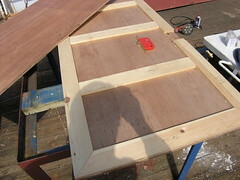 The frame itself is a planed down section of 2" * 2" piece of timber, with a section so the frame 'sticks out' from the surrounding ply and has a flat edge for the door to rest against on the opposite side. I already know the completed door fits width wise, but not length wise. I'll trim the door exactly to size once the frame glue is properly dry and I have the time to measure it all up correctly. Now is not the time to make any hasty measurements and/or cuts.